We finally got round to recording our old tapes and sticking them up on Soundcloud the other day. 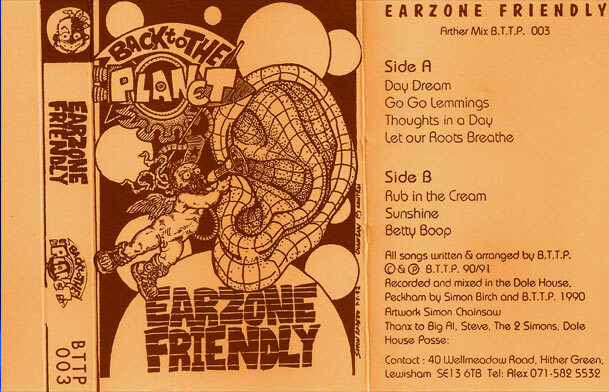 Earzone friendly was the first of our tape LPs, it was recorded on a 4 track Fostex cassette player at the dole house with a bunch of borrowed mics and bits and bobs belonging to our great engineer Simon Birch. Simon later worked with us on the Warning The Public cassette LP and helped remix a few tracks after that. He was our live engineer too for quite a few gigs and an infamous disaster tour of Spain. Guy’s keyboard was a Casio home organ, and we had been together for about 6 months by this time. The Dole house was a squatted Unemployment Benefit Office in Peckham South London, and we played there many times over the 18 months it was in existence. we became the house band due to the fact that all out gear was stored there and we used to lend it out to other visting bands on gig nights. The whole EP was recorded in the main hall, which had a great sound to it, in one afternoon, then Fil overdubbed some vocals and that was it!! Basic but great.